Reddish Vale Golf Club celebrating its hundredth year has an early season success to celebrate after Nigel Ashworth won the coveted B&H Balfour Cup. Nigel a 7 handicapper at Reddish Vale used his local knowledge to good effect in returning a nett 69 but had to survive the dreaded cpo as Ellesmeres Steve Leece also posted a nett 69 leaving them two shots clear of Altrinchams Lee Warren who posted a 71 on the day. The field of 93 players from 17 clubs were treated to a course in superb condition and set up to challenge the quality field which saw Vales Ryan Jackson take the Best Gross Prize with his 72 playing off scratch. 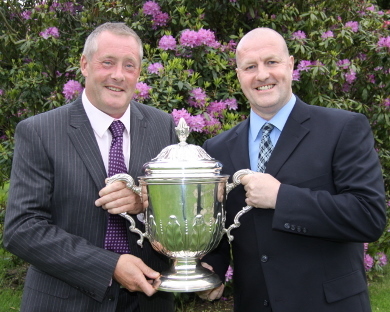 The Swinton Park pairing of Brian Kynaston and Andrew Shelmerdine made the short journey from their home club to Worsley Golf Club and returned with the coveted Houldsworth Cup with a score of 1 up in the Bogey Competition. It would take a card playoff to separate runners-up Michael Wallwork and Brian Connor from Davyhulme Park and the Houldsworth pairing of Graham Bardsley and Steven Richardson with both pairs returning an all square score. 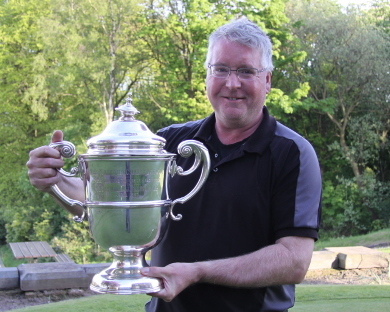 The competition first played for in 1897 with 85 pairs competing for the wonderful trophy donated by Sir William Houldsworth which some 115 years later has still attracted a field of 82 pairs from 12 different clubs to play on a superbly presented course at this year’s venue Worsley Golf Club. The Balfour & Houldsworth G.S. 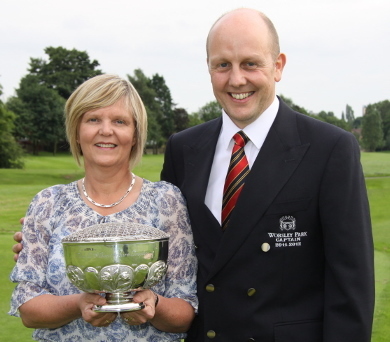 Lancashire Trophy turned into an emphatic victory for the Marriott Worsley Park husband and wife pairing of Alan and Sue Rudman who finished 8 points clear of John Riley and Janice Rowlands from the host club Swinton Park. With one of the best scores posted for sometime in the GS Lancashire Trophy the return of 41 Points was largely due to some fantastic work by Sue on the superb Swinton Park greens as she holed putt after putt on the way to victory with Alan giving her a read, according to Alan that is. Previous winners Craig and Karen Cuthbert from Stand and Prestwich had to settle for third place coming home with 32 Points.